If you live in Switzerland or use Swiss maps, chances are that you have to deal with the "Swiss grid" (or Swiss coordinate system), which is a simple and practical coordinate system especially designed for this country. The coordinates of the origin are chosen in such a way that all points in the country have positive coordinates and that the easting (x) is always greater than the northing (y). In this way, many errors can be avoided. Coordinates are expressed in meters and give a good feeling of the distances. This system uses an oblique Mercator map projection based on an 1841 Bessel ellipsoid. The geodetic datum called "CH1903" uses the old observatory of Bern (which doesn't exist anymore) located at 46.951083°N, 7.438639°E (WGS84) as fundamental point. This point corresponds to the coordinates x = 600'000 E, y = 200'000 N in the Swiss grid and corresponds to the centre of the projection. This calculator is based on approximate formulas that do not involve any trigonometric function. These formulas have a precision better than one meter on the whole Swiss territory. Usually coordinates are read from 1:25'000 maps or GPS receivers, this precision is more than enough and there is no need to implement a more complex algorithm. To use this calculator, just enter the coordinates in one of the three formats/projections and hit corresponding "calculate" button to calculate the other two. The "get current location" button will try to obtain your current coordinates from your browser: it only works if geolocation is supported and enabled in your browser, and works better with devices equipped with a GPS. If you need to convert to or from QTH locator squares, a converter is available here. 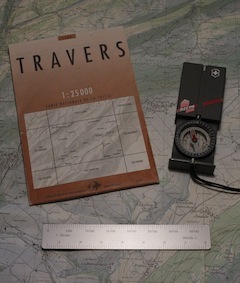 This converter is based on the algorithm described in "Solutions approchées pour la transformation de coordonnées CH1903-WGS84", Office fédéral de topographie "swisstopo", Octobre 2005.